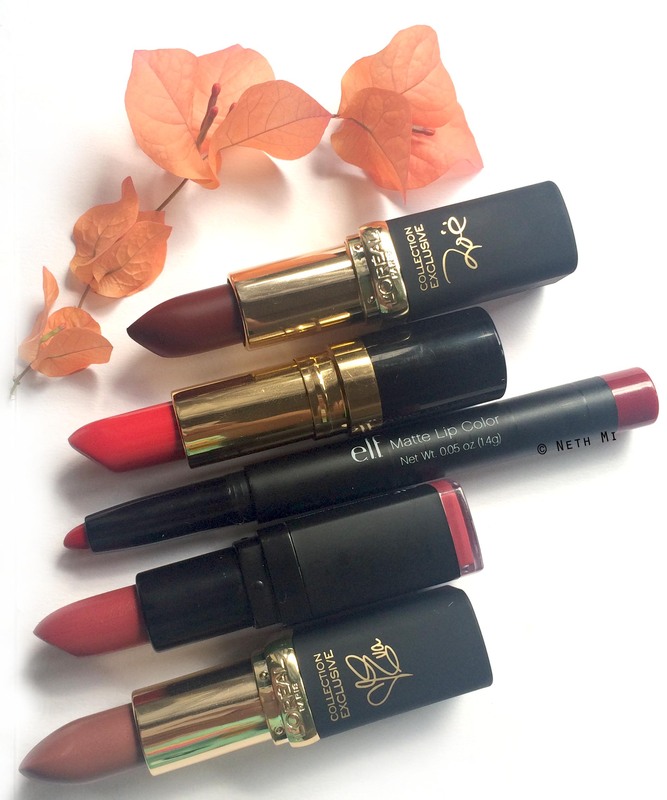 Fall is always associated with warm, rich colours, and a deep red is a must-have for every makeup-junkie in the world. My favourite deep-red is Zoe’s Red from L’Oreal. It’s not vampy, so it’s quite wearable on daytime too. This colour works as a dark red for fair to medium skin tones. I find that Revlon’s Love That Red is the brightest & the boldest red colour out there (and is a dupe for YSL’s Le Rouge) All you need is minimal face makeup and some Love That Red for a statement! This is a satin finish lipstick that is super smooth and pigmented, so you need only one swipe for full opacity. We all love some matte lipsticks these days, don’t we? ELF Cosmetics’ Rich Red is the perfect matte red lipstick for fall. It isn’t patchy or drying, and it’s so smooth. It lasts more than 10 hours on your lips, and that means you don’t need retouching at all!